Our railroad is HO scale with 30" radius being the tightest curve. The layout is 16' wide by 105' long and has about 2,500 feet of track. We operate with DCC with detection. The Club known as the Coachella Valley Model Railroaders is a club for promoting the hobby of model railroading in the Coachella Valley. This was to be accomplished through the construction of a premier display layout having prototypical train operations and scenic details familiar to the United States. The layout was to be HO scale and be many times larger than feasible for a home layout. In 1984 the two founding members pooled their financial resources and immediately began to construct the first display to commemorate the 50th year of the National Model Railroad Association. This display was placed in the Westfield Mall (formally Palm Desert Town Center Shopping Mall) for a two day show, from this display we met additional people with our same interests of model railroading. 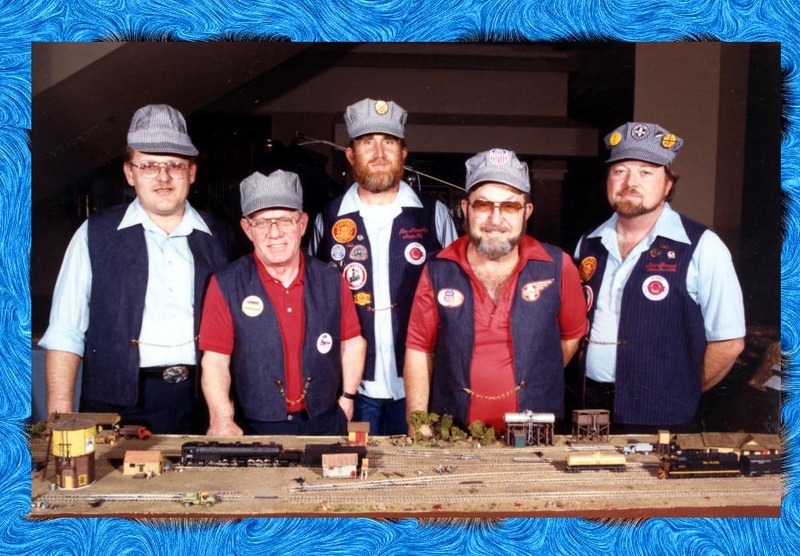 The Coachella Valley Model Railroaders was formed in 1985 by five model railroaders as an informal group who desired to share their knowledge and experiences. The main thrust of the group at that time was to help fellow members in the construction of their home layouts. Once a week for the price of coffee and cookies the hosts layout would hear the sounds of drills and the buzz of saws as his layout quickly grew before his eyes. It was not all work for time could always be found to admire a new steam locomotive or a weathered boxcar. The first real project the club tackled was to build a modular layout to be displayed and ran at the Westfield Mall (formally Palm Desert Town Center Shopping Mall). This first effort was done on time and with the diligent efforts of the members in keeping the display operating through the Christmas Season, it was well received by the mall customers. This showing also provided exposure to other desert modelers and the membership began to grow. The building of the various home layouts continued as did the expansion of the Clubs Modular Railroad. Each year the Christmas Shoppers at the Mall were greeted by an ever larger and more detailed operating railroad. In 1989 an agreement was reached with the Riverside County Fair National Date Festival to be included as an exhibit. After the show at the Mall the layout was moved to the Fairgrounds and installed in the north end of the Crafts and Hobbies building (formally Home Arts Building). The Modules were further expanded so that the layout ran the full width of the buildings north wall and twenty feet down the west wall. Again The exhibit was a great success with club receiving complements from both the viewing public as well as the Fair Personnel. The result of this first Fair Exhibit was that we now had a home year around in the Crafts and Hobbies building (formally Home Arts Building). The following months saw what looked like total mayhem as the old modular layout was dismantled and a new larger permanent railroad was constructed in the center of the north end of the Crafts and Hobbies building (formally Home Arts Building). The building of this layout was unusual in that each member chose a piece of the layout and erected what he wished in that area. So we had a Three Ring Circus complete with sideshow on one end and elaborate industrial switching yard on the other with several yards, siding, towns and villages scattered in between with vast canyons spanned by mighty bridges connecting it all. For the first season of our new Railroad we ran what is called a double dogleg layout around the large U shape that was built. A good operator could keep up to five trains going at once as long as they all went the same direction. The Coachella Valley Model Railroaders is anything but static. Each year the main layout has expanded and grown with the new additions such as DCC. The changing of the track design was to allow two-way running was one of the greater changes to take place. Every year sees new things in place to entice the visitor to come and see us. And come and see us they do. The Club is one of the main attractions during the fair with question and answer sheets that sometimes put the members on their mettle to answer them. Often times it may be an old gentleman and his wife from whom the layout elicits a fond memory of some long past job or pleasure. The Coachella Valley Model Railroaders is an active community group with an interest in railroading and model building and we invite any person of good moral character to join the Club and enjoy the friendly people who are the Coachella Valley Model Railroaders. The Club currently has 32 regular members from all occupations. doctors, photographers, pilots, and so on. Membership is open to anyone with an active interest in railroads and modeling. The level of experience ranges from armchair modelers, to novices, to experts. For most of us, the fun is in the learning. For a limited time, new members can join for half price, only $75.00 for the first year and we waived the one time fee. Run trains, enjoy the camaraderie, and contribute to our fair-ground commitment: Maintain the cleanliness and appearance of our building and restroom, a reasonable requirement considering what we get in return. Check your engines and rolling stock before you place them on the layout. This means couplers AND clean wheels for your engines and rolling stock. Dirty wheels cause dirty tracks and DCC problems. If you have operating issues, please remove your equipment so others can continue operating while you use the work bench to correct your problem. The last car in a consist should have an EOT indicator, a lighted car, or resistance wheels so that our track detection will see it. To avoid loco address conflicts, check the Engine Dispatch Board located in the workbench area to ensure that your loco’s address is not being used. Then list your name and your loco’s address. Before leaving, remove your information from the board. No food or drinks inside the layout. Spills do happen which cause problems. Please keep the layout clean. Before placing your train on or removing it from the layout, make certain that the yard’s lead-track power is off. With power on, a system short can occur. No big deal. However, that short could also foul up your engine’s decoder. Very big deal! Casey Jones is watching. Be aware of the trains ahead of and behind you. If you use a turnout, return it to the original position when clear. If you inadvertently stop on the mainline, advise those behind you. Use the spring-loaded, three-position toggle switches for turnout control whenever available, but use momentary contact only. Holding a switch against the return spring will burnout the motor. Never flick the turnouts with a finger in order to move them. Our turnout motors are being replaced. and they will be controlled by two position, unsprung switches that will eliminate this problem. So, if you feel spring pressure when you move a toggle switch, let go when it reaches the fully displaced position. If you inadvertently break something on the layout and cannot fix it yourself, tell a board member so that it can be fixed. No harm, no foul, it does happen. If your train has a problem, take it to the work bench and fix it or reprogram it. If you need help, it’s free for the asking. When you’ve finished running a train, it’s important that you dispatch it (remove it from the system’s command station). While the loco’s address and speed is displayed, set the speed to zero and press the EXIT key to remove the address from your throttle and the system. Ref: Digitrax DT 402 throttle instruction sheet—Digitrax.com has the latest version of all their instruction sheets and manuals. If your drink cup contains liquid and/or ice, please don’t empty it into our trash bins. The liquid will seep out make a mess. Pour liquid and/or ice into our sink or outside on the grass before you throw your cup away. Wheel cleaning stations are located at the workbench. Coupler standards - Kadee type couplers set to NMRA standards. Wheel standards - All metal wheels. Consists - Lightweight cars should always follow heavy cars, not precede them. When on curves, the drag from heavy cars may cause the light cars to derail and/or break couplers. Passing and yard tracks - No parking on a passing track when taking a break. Leave your train on a yard track. When several members are operating trains—an open house or the fair—be considerate of others and do not set out more than one train so that yard tracks are available to other members when needed. DCC frustration: Someone sets up his train on a yard track, but when the throttle is activated, the engine does not move nor do the lights, horn or whistle work. He asks for help and is told to put his loco on the work bench’s programming track and reset the decoder to the factory default address, 03. Now it works, but he must reprogram the loco’s address and customized CVs, a time consuming task. I hope he kept a record of his CV settings. In the preceding situation, the operator didn’t hear someone yell, “Short,” during his setup. Yep, that was his train, and it happened because he did not ensure that the yard track’s power was off. That short confused his loco’s decoder, which immediately played dead. DCC can play wicked tricks when proper operating procedures are not followed. During the fair, run your train when scheduled to do so. You can visit the fair grounds when not scheduled at the club. If taking a food break, use the table and chairs on the upper balcony. Have fun. It’s the world’s greatest hobby, and we are truly fortunate to have this facility. We hold our annual membership meeting along with our election of officers on the first Wednesday in December. Visitors are always welcome on any meeting or session night. The Club has formal, click for By-Laws and elected officers, but we work to keep the atmosphere informal. How do you learn it all? as well as how to books on every facet of the hobby. You can find them at most hobby stores. Visit a hobby shop specializing in model railroading. the real secret to getting started is to just jump in and get your feet wet. you can learn from the experiences of others. and one that you can enjoy at home or as a member of a Club.